Jason Bohn is in a stable condition in hospital after suffering a mild heart attack during the second round of The Honda Classic, the PGA has said. The 42-year-old American, a two-time PGA Tour winner who is ranked 71 in the world, called for a doctor when he experienced chest pains after putting out in 18th hole at PGA National. A report on www.pgatour.com said: “He was taken by ambulance to Palm Beach Gardens Medical Center, where tests revealed a mild heart attack. “Bohn was in stable condition and will remain hospitalised overnight before undergoing more tests on Saturday. Bohn withdrew from the tournament following his second-round 72, which would have seen him make the cut. It was missed by Rory McIlroy for the second year in succession as Rickie Fowler recorded another flawless 66 to lead in Florida. Scottish Open champion Fowler had four birdies and no bogeys for the second day running to reach the halfway mark at eight under par, one shot ahead of his fellow American Jimmy Walker, who finished birdie, eagle in his own 66. The overnight joint leader Sergio García had three birdies and two bogeys in a 69 to lie six under, with the former world No1 Adam Scott a shot further back after a brilliant 65. In contrast, the former champion McIlroy – who became world No1 for the first time following his win in 2012 – struggled to a 72 to finish four over par and miss the cut by a single shot. McIlroy, who walked off the course in the defence of his title and also lost a play-off in 2014, did manage four birdies but also found water on two par-threes to run up a double bogey on the 15th and a triple bogey on the 5th. Fowler is yet to drop a single shot, although the 27-year-oldadmitted he was fortunate to escape with a wild drive on the 1st, his 10th hole of the day. Fowler won on the European Tour in Abu Dhabi in January and was pleased to bounce back from letting another victory slip from his grasp three weeks ago in Phoenix, where he had been two shots clear with two to play before losing in a play-off to Hideki Matsuyama. “Nice to put together a couple of good rounds after Phoenix,” Fowler added. “I played really well there, played well down the stretch, it just didn’t go my way. I’m excited to be back in contention here. García, who described his own play as “terrible” after missing the cut in the Northern Trust Open last week, was pleased with his 69 that could easily have been one better after finishing millimetres away from a hole-in-one on the seventh. “When I saw it rolling up the hill I thought it had a great chance and unfortunately it didn’t go in,” Garcia told PGA Tour Radio. “Making two there was already a good thing, but a one would have been amazing. “Overall I felt like I played quite well. Obviously the course is not getting any easier as the week goes on. The wind was not up as much as yesterday but it was still challenging. Scott won the Masters in 2013 using a long putter but has successfully reverted to a conventional club in order to comply with the ban on anchored strokes which came into effect on 1 January. The defending champion Padraig Harrington recovered from playing his first two holes in three over par to card a 68 and finish one over par, with his compatriot Shane Lowry a shot behind after adding a 75 to his opening 67. Scot Russell Knox, second and third in this event over the past two years, is joint-20th after a brace of 70s but compatriot Martin Laird missed the cut. His second-round 69 was not quite enough to repair the damage of an opening 77. David Drysdale carded a third sub-par score but faces a tough task trying to catch former Open champion Louis Oosthuizen in the ISPS Handa Perth International. The Scot sits joint-11th heading into the last round at Lake Karrinyup after posting a 69 for an eight-under total. Drysdale was out in three-under 33, having birdied the second, three and seventh before mixing two more birdies with two bogeys on the back nine. Jamie McLeary, the only other Scot left in the field following Stephen Gallacher’s withdrawal due to an ongoing hand problem, is joint-26th on five-under after a 71 that contained a mix of six birdies and five bogeys. Oosthuizen, following up his 64 on day two, was flying on seven under after 15 holes and for a short while boasted a five-shot lead over the chasing pack. However, back-to-back bogeys on the 16th and 17th - the first shots Oosthuizen had dropped since the second hole on day one - left the South African having to sign for a five-under-par 67. That still left him on 15 under for the tournament though, and boasting a three-shot lead over nearest challengers Romain Wattel and Peter Uihlein, who had contrasting third rounds. 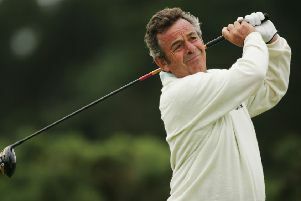 Frenchman Wattel is a former Scottish Stroke-Play champion, having claimed that title at Gailes Links in 2010. Struggling to make the cut after an opening 77, Pamela Pretswell is just outside the top 10 heading into the final round of the RACV Ladies Masters. The 26-year-old followed her 70 on Friday with a third-round 71 at the Royal Pines Resort on the Gold Coast to jump 24 spots into joint-12th. On one-under, Pretswell is nine shots off the lead, held by Jiyai Shin after the South Korean moved into pole position with a 71 in tough conditions.